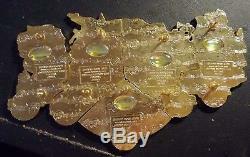 PUZZLE 5 PIN COMPLETE SET. Rare Hard Rock Cafe pins. 5 out of 5 pins from the Pinapalooza 2003 pin complete set. Includes: "H" - Puzzle Piece West. This pin has the "H" and part of "A" for Hard Rock with the logo at the bottom. It has a variety of objects depicted, including the California flag, a train, an orange, filmstip with two actors, surfer, cowboy, and a partial US map with a cactus. "Ard" - Puzzle Piece Central West - piece 2 of 5. Shows letters "A" (most of it), "R" and "D". And a Piece of the globe. "Ro" - Puzzle Piece Central East. Piece 3 of 5 "ck" - Puzzle Piece East. Central, depicts word'CAFE', Florida scenery "World Wide Trading Event" piece 5 of 5. These pieces were available only at selected Cafes. Each was a limited edition of 1200. Limited edition of 1200 sets All items are originals and in mint condition, unless otherwise stated in description. Items will be carefully packaged in bubble wrap, and inside a bubbled envelope, or box, depends on the size. 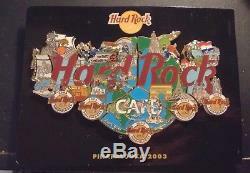 The item "HARD ROCK CAFE PINAPALOOZA WORLDWIDE EVENT 2003 PUZZLE 5 PIN COMPLETE SET" is in sale since Saturday, October 28, 2017. This item is in the category "Entertainment Memorabilia\Music Memorabilia\Rock & Pop\Artists H\Hard Rock Café\Pins". The seller is "jobego31" and is located in ATHENS, GREECE. This item can be shipped worldwide.